The Bernabéu reincarnated the "Wild West" this Wednesday night as goals simply came down like rain in the coldest of the winters. Real Madrid defeated Sevilla by 7-3, with Gareth Bale and Benzema each netting a brace, while Cristiano Ronaldo scored a hat-trick and dedicated his first goal to FIFA's president Joseph Blatter, by doing a commander salutation and earning a new nickname: "El Comandante". "El Comandante" Cristiano Ronaldo reported to duty with a hat-trick, but the first man to shine at the Bernabéu was Gareth Bale. The former Tottenham star finally started showing a tiny bit of what people expect from him and broke the deadlock against Sevilla in the 13rd minute of the first-half. Isco cutted inside from the left, spotted Benzema escaping from his marking and sent him a low pass. The Frenchman then controlled it with his left foot, lifted his head and delivered an excellent pass to Gareth Bale. The Welshman had one touch on the ball to set it up and then fired it past Beto to make it 1-0 for Real Madrid. Great goal from Bale and great way to start what would end up being a very entertaining league game. Roughly 14 minutes later, the Merengues reached their second goal and once more, it came off Gareth Bale's feet. Cristiano Ronaldo handed his teammate the opportunity to take a long-range free-kick and the ex-Tottenham winger proved he can also be as lethal as CR7 from set-pieces. His shot still got deflected on the wall Sevilla built up in front of the ball, but it actually helped tricking Sevilla's goalkeeper since the ball ended up going the opposite way. In the 32nd minute, Isco's attacking play ended with him falling as he was entering Sevilla's penalty area. It doesn't seem as there has been too much of a contact to justify that the former Malaga midfielder went down, but the referee pointed to the spot and granted Madrid with a golden chance to extend their lead to 3 goals. 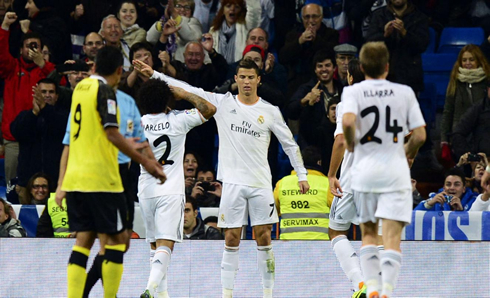 As usual, Cristiano Ronaldo stepped up to the mark and blasted it to the back of the net. 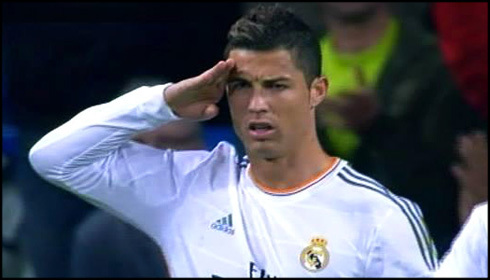 During the goal celebrations, Ronaldo was keen to remember the mocking he has been victim of from FIFA president Joseph Blatter and through a hand gesture and strict posture he imitated a military commander (Blatter compared him to a "commander on the field"). 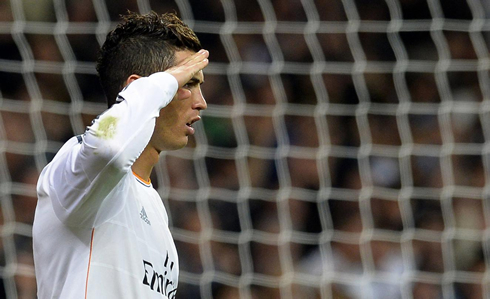 In Spain, Cristiano Ronaldo's new nickname is now all over the place: "El Comandante". At that point, it was hard to believe Sevilla could still have a say in this game. However, the reaction would start taking place in the 38th minute, after another very dubious decision from the referee. Sergio Ramos reached out to Diogo Figueiras inside Real Madrid's penalty area in order to challenge him for a bouncing ball, but the Sevilla's right-back immediately went down as the two players got side by side. Teixeira Vitienes must have seen something else and awarded the visitors with a penalty-kick opportunity. Rakitic was called to convert it and didn't miss his chance to put his name on the scoreboard. There would still be time for another Sevilla goal before the break though, this time coming from an attacking play on the left wing. Arbeloa got beaten on speed by Vitolo, who then passed the ball over to Jairo and already inside the 18-yards box, just before the final assist to Carlos Bacca took place. The Colombia striker had an empty net in front of him and had no problems in tapping the ball in, reducing Real Madrid's lead in the game to 1 goal. Real Madrid regrouped during half-time and started the second-half the same way they had started the game: scoring first. Ronaldo led the attack through the center, sent the ball over to Bale on the right and the 24-year old calmly read the movements inside the area before putting a low cross to Karim Benzema. The former Olympique Lyon forward controlled the pass with his right foot and easily made the ball going through everyone in front of him to restore the 2-goal lead to Real Madrid once more. The 5-2 was produced by another impressive Gareth Bale run on the right wing, who ghosted past two defenders before crossing the ball towards Cristiano Ronaldo. The 28-year old forward finished it off as only world-class strikers do, responding to the bouncing cross with a one-touch strike. 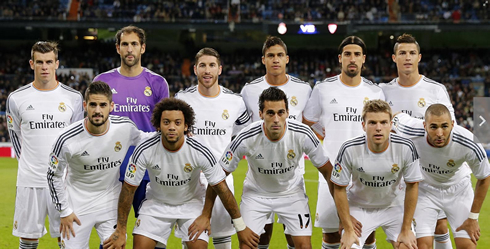 Beto still got his hand to it, but he failed to stop the shot and Real Madrid was in front by three. However, it wouldn't take long for Sevilla to threaten getting back in game discussion once more. A true moment from inspiration by Rakitic allowed the Croatia international to score the most beautiful goal of the night, through a perfectly accurate shot that gave absolutely no chance to Diego López. The former Schalke 04 footballer saw his shot going straight into the top left corner of Real Madrid's goal and with that he set the score to 5-3 at that time. Fortunately for the public, unlike many other games we've been seeing in the Bernabéu this season, Real Madrid didn't slow down the pace and kept going after more goals. With 72 minutes on the clock, Modric combined well with Karim Benzema, the France international then touched the ball to Cristiano Ronaldo and the Portuguese cutted inside as he loves doing just before striking the ball with his right foot. The shot got deflected on the legs of a Sevilla defender who had slided in front of him and the ball ended up going over Beto's head before crossing the goal line. "El Comandante" had scored his hat-trick and is now tied with Atletico Madrid's Diego Costa as "La Liga Pichichi", as both have 11 goals. Barcelona's Lionel Messi is behind the two, with 9 goals scored so far. The final score was set when we only had 10 minutes left on the clock and it was Karim Benzema who had the honor to seal the deal for good at the Bernabéu. Marcelo went down the left wing to put a perfect cross to the far post and the Frenchman rose in the air to head it to the back of the net. That's a 7-3 scoreline on a football game at the Santiago Bernabéu and Real Madrid assured they will remain 6 points behind Barça in La Liga standings, at least for a few more days. Cristiano Ronaldo next game for Real Madrid will against Sevilla for the Spanish League 'La Liga', this Wednesday (October 30, 2013). You can watch Juventus live stream, Rayo Vallecano vs Real Madrid, Barcelona vs Espanyol, Newcastle vs Chelsea and Arsenal vs Liverpool, all matches provided from our streaming soccer section.